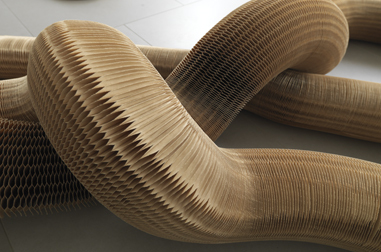 Li Hongbo, ‘Paper’. Courtesy: The White Rabbit Collection. A pleasant surprise. What a nice way to start the new year of art! If low expectations are the key to satisfying exhibition viewing, then no expectations are even better! I have to admit, I wasn’t even thinking about art when I went to White Rabbit recently, I was just trying to escape the humidity. Actually it wasn’t even all that hot and sticky on the day in question, but my brother, visiting from a northern hemisphere winter, seemed to literally be melting before my eyes. We needed air-conditioning and we needed it fast. Still reeling from the trauma of the Westfield underground parking station on Boxing Day, I could not face another movie, so an art gallery became our destination of choice by default. And what a happy accident. Up on the top floor I found the best thing I’ve seen in ages, Li Hongbo’s extraordinary sculpture, Paper. Li Hongbo presents two almost life-sized figures carved from glued layers of thin, concertinaed cardboard. One is almost ordinary, aside from the fact that his head is drooping off to one side. It looks like he might be wearing a particularly silly knitted hat. But the other chap has lost the plot completely. His whole body, excluding the tips of his fingers and toes, has uncoiled and lies in loose loops across the gallery floor. He seems to be a physical manifestation of a massive mental breakdown: it’s as if he has come unstuck in more ways than one. Unfortunately, the image I have of Li Hongbo’s work from the White Rabbit website doesn’t do the piece justice. I asked for a better one, but my request seems to have been declined. I guess this is what happens when you no longer write for a major newspaper!! Never mind. Like all good art, you really need to see it in person anyway, and besides, it’s nice and cool up there. Happy New Year! Yes – indeed it is a wonderful work – The show finishes at the end of this month – so be quick! thanks for the heads-up re closing date. I could not find it! I agree. ‘Paper’ is an artist’s invention which goes to extraordinary lengths to describe how it feels to be stretched in several directions at once. See more images of this phenomenon in the December 2010 issue of Artlink. As the most spectacular piece in the museum, it somehow missed being featured in the Big Bang catalogue, an otherwise comprehensive publication about the selection on show at White Rabbit at the moment. The bright bright coloured shiny and chunky catalogue is a great gift to present to people who dont ‘get” contemporary art. Rather like White Rabbit itself, it is cunningly designed to hook people in, and get them thinking for themselves. Ah, the stretched feeling… I know it well! Thanks for your comments. The Paper sculpture is amazing! I also loved the urinals and the sunflower seeds! Yeah, lots of cool things and nice and cool inside!